A United Nations (UN) treaty on the control of toxic exports has been ‘utterly discredited’, unions have said. The charge came after a bid to add chrysotile asbestos – the only form of the cancer-causing fibre still traded – to the Rotterdam Convention’s list of the most hazardous substances was blocked for a sixth time. 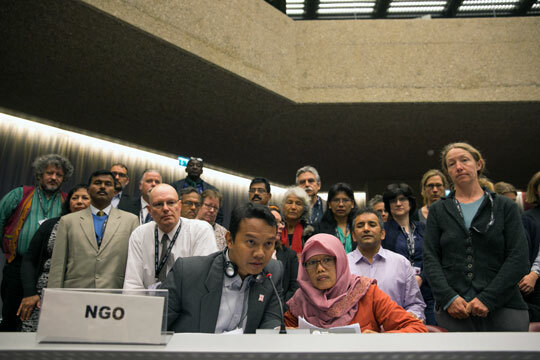 On 3 May 2017, at a UN-organised conference in Geneva, out of the 156 countries party to the convention, just seven with commercial interests in continued asbestos use – Belarus, India, Kazakhstan, Kyrgyzstan, Russia, Syria and Zimbabwe – vetoed chrysotile’s addition to the treaty’s ‘prior informed consent’ list, a measure that would require exports to be accompanied by a health warning. It requires a unanimous decision of government representatives for a substance to be listed. Addition of chrysotile to the list cannot now be considered until the next conference, in two years’ time. 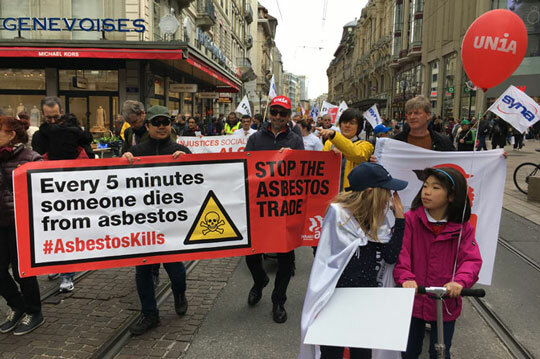 It was an outcome that caused anger and exasperation in the contingent of global unions, campaigners and asbestos disease sufferers in attendance in Geneva to put the case for long overdue action that would both save lives and that met all the UN’s criteria for listing. An attempt to change the voting rules so a 75 per cent majority could agree listing also failed. The highly toxic pesticide paraquat was another victim of the unanimity requirement, again missing out on listing. The Convention’s expert group had said both substances met all the requirements for listing. KEEP FIGHTING Over 3,000 Japanese construction workers and their families held a mass meeting in Tokyo on 19 May 2017, to mark the 9th anniversary of ongoing asbestos compensation litigation. So far only six cases have been settled. Their traditional paper fans – uchiwa – carried a message on each side. The pink face calls for ‘an end of the asbestos disaster!’ The blue face calls on the ‘government and guilty companies to apologise’. 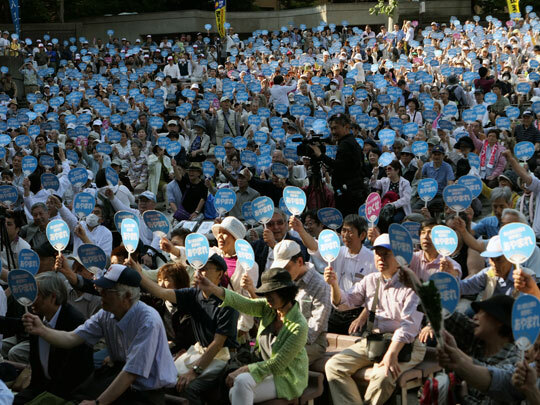 ‘Apologise, compensate, eliminate’ is a regularly used slogan of the anti-asbestos movement in Japan. 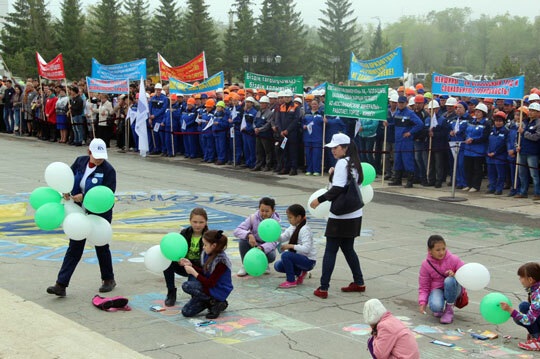 CHEAP SHOT In June 2017, residents of Jitikara in Kazakhstan, many employed by the global asbestos giant Kostani Minerals, attended a pro-asbestos rally. Speakers castigated the efforts of the health and safety campaigners and international trade unions who have called for an asbestos ban, saying the cancer-causing fibre is a “natural and cheap material” that is safe to use. 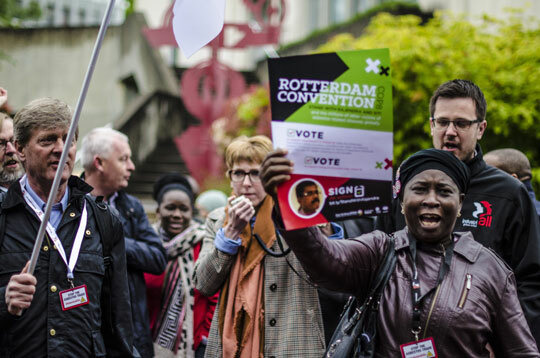 VETO NOT VETOED Unions backed a proposal to reform the voting rules at the Rotterdam Convention’s 2017 conference, so a 75 per cent vote could lead to listing of a hazards substance under the Prior Informed Consent rules. The change would have brought the treaty into line with the Basel and Stockholm conventions, the UN’s two other treaties on hazardous substances. But the asbestos lobby’s obliging rump of pro-asbestos governments vetoed an attempt to end its veto. BEYOND REASON After listing of asbestos under the convention’s ‘prior informed consent’ (PIC) provisions was again blocked, the asbestos industry’s global lobby group ICA said: “Reason had prevailed.” Asbestos disease sufferers Rajendra Pevekar (back centre) from India and Siti Kristina from Indonesia (front right) had earlier told the conference their reasons for supporting adding chrysotile to the PIC list. 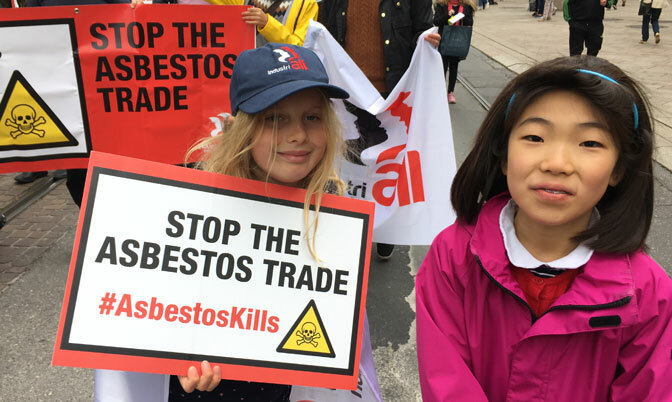 REPEATED FAILURE In May 2017, the Rotterdam Convention secretariat conceded a small handful of asbestos producing nations had again blocked attempts by UN agencies to require basic health warnings on deadly asbestos exports. 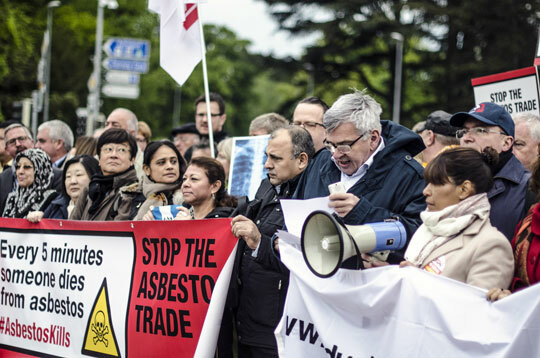 This sixth success failure to list chrysotile asbestos under the Rotterdam Convention’s ‘prior informed consent’ controls on the most hazardous substances left the treaty ‘discredited’, global unions said. 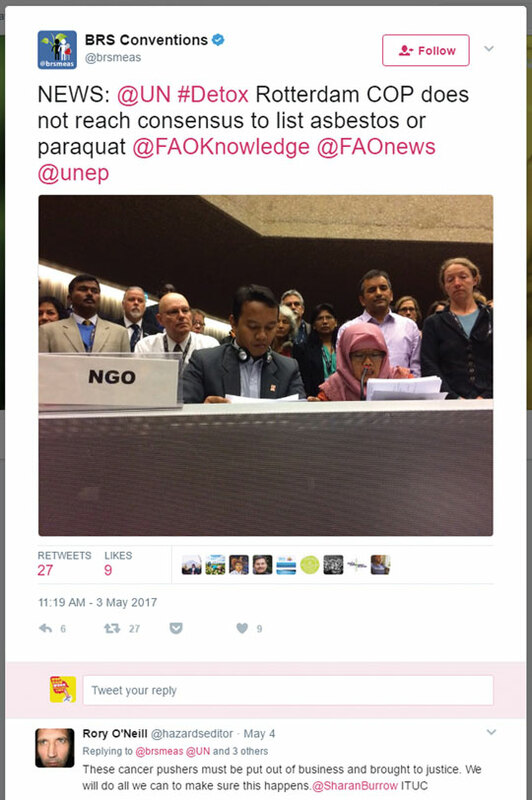 The agrichemical lobby succeeded in keeping the highly toxic pesticide paraquat off the list.